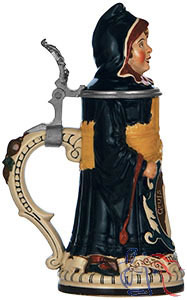 Although listed as model number 1 in old manufacturer catalogs, this stein was not initially produced until 1891, replacing an earlier non-figural Munich Child stein. Same model number also applied to a Bearded Man Jug. See also Nos. 789, 894, 895 and 905.